I don't know exactly what I did here and how it got to this point, but I show two active networks, one being my home network and on being an unidentified network. As you can see, they are both connected to my wireless router and it makes absolutely no sense why I have two active networks. I have been beating my head off of a wall trying to figure this one out. Does anyone have an idea on how to delete this unidentified network? Of course I would figure it out 3 seconds after I post something. Well, if this ever happens to anyone, make sure your default gateway is set properly. For some reason mine was wrong, I changed it back and voila, it was gone. make sure your default gateway is set properly. I'm using an Apple AEBS as my router. Usually this is because of a router that isn't configured correctly or doesn't have the correct firmware to work with Windows 7. It's just one connection with two default gateways so it shows up as two connections. You can usually fix this problem by going into your IPv4 connection properties window and typing in the correct default gateway manually. I think you are getting the second one from your modem. The link below shows you where to type the correc default gateway. Strangely enough, I went to the IPV4 Properties, manually entered in what I thought was the correct IP address, subnet mask, and default gateway only to have it not connect at all. When you type in the IP,subnet mask and everything else then you are setting up a static IP which isn't really what you want. 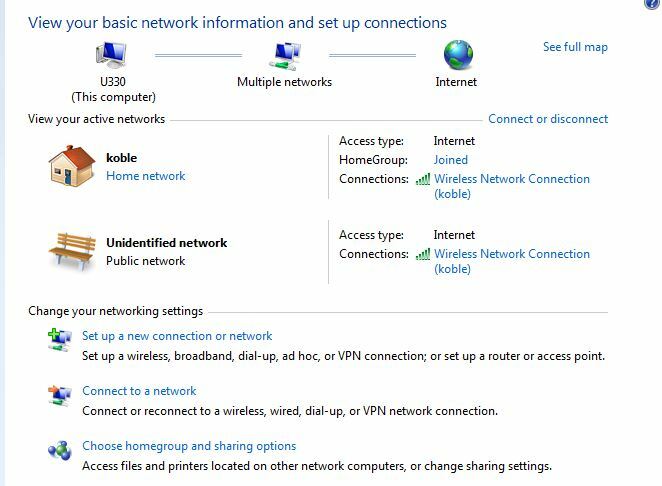 You would need to set up your router for static IP's also for that to work. Try rebooting to make sure the correct default gateway stays put then you should be ok after that. Slow web browsing and many active connections. Howto check if a connection is active when multiple connections activ?